Memorial Day is a tradition that dates back to 1868, when Union Army General John A. Logan placed wreaths on the graves of fallen Civil War soldiers and issued a proclamation calling for a day of national observance for their sacrifice. More than a century later, President Nixon officially declared the last Monday of May as a federal holiday to honor the American soldiers who died serving in the armed forces in all wars. Though many of us celebrate the day with social events like cookouts, barbecues and backyard get-togethers, the true meaning of Memorial Day is much deeper than that. To help you mark the occasion with the respect it deserves, here are seven ways to experience Memorial Day this — and every other — year. Memorial Day parades offer us a way to join together as a community and honor the brave men and women who've given their lives for the sake of our freedom. Scheduled to take place in the afternoon on May 28, the National Memorial Day Parade in Washington, D.C. is by far the largest in the country, and includes patriotic marching bands, dazzling floats and a family-friendly atmosphere. In New York City, each of the five boroughs will hold an elaborate Memorial Day parade this year. The biggest one is the Little Neck–Douglaston parade in Queens, and the oldest is Brooklyn's Memorial Day parade, which is about to celebrate its 150th anniversary. War memorials are sacred places where we commemorate the courageous men and women who made the ultimate sacrifice for the United States. Inscribed chronologically with the names of more than 58,000 American soldiers who gave their lives in service to the country, the Vietnam Veterans Memorial in Washington, D.C. is an unforgettable place to visit on Memorial Day, or any other day for that matter. Likewise, the National D-Day Memorial in Bedford, Virginia, offers visitors a variety of ways to honor the soldiers who fell on Omaha Beach in 1944. Since Memorial Day is a time when we honor fallen service members throughout our country's entire history, a trip to a U.S. military museum is a terrific way to celebrate the true meaning of the holiday. The National WWII Museum in New Orleans is one of the finest educational facilities of its kind in the world, and will be hosting several Memorial Day events this year, including a performance by the U.S. Marine Corps Band. Other museums worth visiting include the National Infantry Museum in Columbus, Georgia, and the U.S. Naval Academy Museum in Annapolis, Maryland. Bringing flowers to a veterans' cemetery is an important way to honor the soldiers who died fighting for our country. That's why each year on Memorial Day weekend, Arlington National Cemetery in Virginia holds a deeply moving wreath laying ceremony that's open to the public. If you'd like to participate in a similar ceremony at a veterans' cemetery near you, the U.S. Department of Veterans Affairs webpage offers a complete list of VA national cemeteries in every state, including up-to-date info on Memorial Day ceremonies being held at each of them this year. From the glorious sound of “The Star-Spangled Banner," to the classic song “America the Beautiful," music and Memorial Day go hand-in-hand. So, this year, why not celebrate the holiday with a patriotic concert? Chances are there's a local school or a municipal auditorium near you that's hosting a live musical event to mark the occasion. Or better yet, take a trip to the West Lawn of the U.S. Capitol in Washington, D.C. and enjoy the annual National Memorial Day Concert, which features incredible musical performances, vintage documentary footage and powerful dramatic readings by well-known celebrities. This spectacular concert is broadcast on PBS each year, but the live event is free for the pubic to attend in person. Exploring one of the many historic forts and garrisons located around the country is a fascinating way to pay tribute to the military heroes who helped shape our nation. Fort Verde State Historic Park in Arizona, Fort Sumter National Monument in South Carolina and Fort McHenry (the birthplace of Francis Scott Key's song “The Star-Spangled Banner") in Maryland are all highly recommended public parks that bring history alive on Memorial Day. Memorial Day is about honoring fallen service members, but that doesn't mean that we can't use the holiday to show our veterans and enlisted men and women how much they mean to us. A great way to do that is by visiting a local veterans' hospital or a nearby VFW post. A simple gift of cookies, cards, poems or flowers might do more to lift the spirits of an aging veteran than you could possibly imagine. Or if you're already planning to host a backyard barbecue this year, try reaching out to the family of someone currently serving in the military overseas and invite them over to share a Memorial Day that you'll never forget. Wherever your Memorial Day travel plans take you, United is there to help. 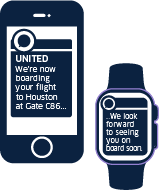 Visit united.com for more info, or use the United app to book your next trip.